[115 Pages Report] The EMEA 3D cone beam computed tomography systems market is valued at 178.4 Million in 2017 and is expected to grow at a CAGR of 9.0% during the forecast period, to reach to USD 300.4 Million by 2023. Base year considered for the report is 2017 and the forecast period includes 2018 to 2023. Top-down and bottom-up approaches were used to validate the size of the EMEA 3D cone beam computed tomography systems market and to estimate the size of other dependent submarkets. Various secondary sources such as associations National Institutes of Health (NIH), International Federation of Endodontic Association (IFEA), International Association of Dental Traumatology (IADT), International Association for Dental Research (IADR), FDI World Dental Federation, Italian Dental Association, French Dental Association, Confederation of European Otorhinolaryngology-Head and Neck Surgery, Saudi Dental Society (SDS), Egyptian Dental Association (EDA), South African Dental Association (SADA), Israeli Dental Association (IDA), World Health Organization (WHO), Centers for Disease Control and Prevention (CDC), and Medical Records Institute, directories, industry journals, databases, and annual reports of the companies have been used to identify and collect information useful for the study of this market. Primary sources such as experts from both supply and demand sides have been interviewed to obtain and validate information as well as to assess the dynamics of this market. The major players in the EMEA 3D cone beam computed tomography systems market are Danaher Corporation (US), DENTSPLY SIRONA (US), Carestream Dental (US), Planmeca Group (Finland), VATECH (South Korea), CEFLA (Italy), J. MORITA CORPORATION (Japan), ACTEON GROUP (France), Asahi Roentgen (Japan), and Genoray (South Korea) are some of the major providers of 3D cone beam computed tomography systems. 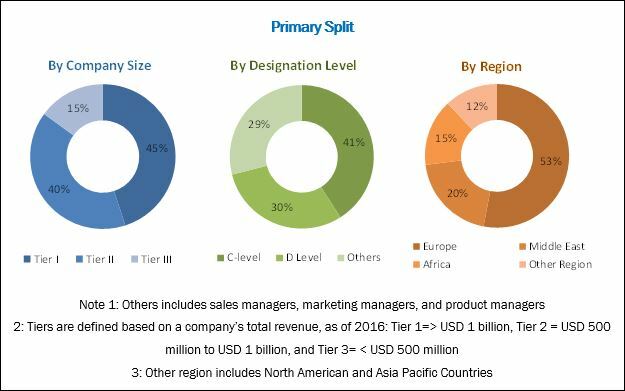 The EMEA 3D CBCT systems market is projected to reach USD 300.4 Million by 2023 from USD 194.3 Million in 2018, at a CAGR of 9.0%. The growing number of dentists is one of the major drivers for the growth of the dental CBCT market in this region. This increase, along with the subsequent establishment of new clinics and rising government spending on healthcare, has contributed to a growing demand for dental equipment like CBCT systems. 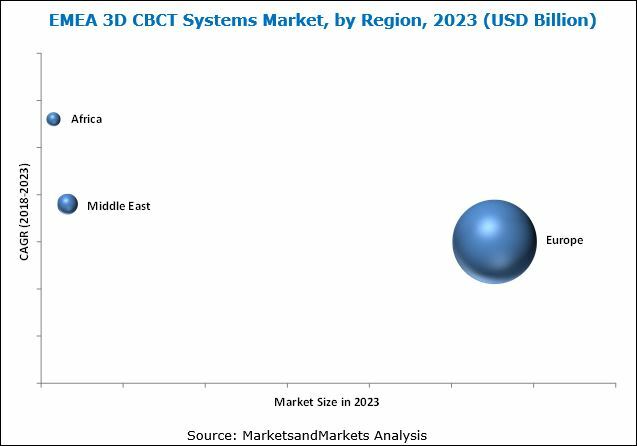 This report analyzes the EMEA 3D CBCT systems market by application, end user, and region. Based on application, the market is broadly segmented into dental and non-dental applications. The dental application segment accounted for the largest share of the EMEA 3D CBCT systems market. The large share of this segment can be attributed to the rapidly growing geriatric population, increase in the prevalence of dental diseases/conditions, low radiation exposure from CBCT compared to conventional analog X-rays, growing demand for cosmetic dentistry, and growing medical tourism for dental services. By type, the dental application segment is further subsegmented into implantology, oral and maxillofacial surgery, orthodontics, endodontics, and other dental applications. The non-dental applications segment is subsegmented into ENT and radiology. The implantology segment accounted for the largest share of the dental application market. The ability of CBCT to provide greater accuracy in measurements at lower radiation doses has made it the preferred option in implant dentistry. The growing dental implants market and increase in the number of vendors offering CBCT units are also key drivers for this market segment. Geographically, the EMEA 3D CBCT systems market is segmented into Europe, the Middle East, and Africa. Europe holds the largest share of this market in 2017. Compared to the Middle East and Africa, Europe has various additional advantages such as investment initiatives by local governments and the presence of high-quality infrastructure for clinical and laboratory research. However, Europe is highly regulated with stringent and time-consuming approval processes that are expected to inhibit the growth of the EMEA 3D CBCT systems market in Europe up to some extent. Even though the market is expected to grow at a high CAGR, the high cost of 3D CBCT system in addition to the lack of favorable reimbursement, is negatively impacting the adoption of new and advanced technologies in the market. 8.9 Asahiroentgen Ind. Co., Ltd.